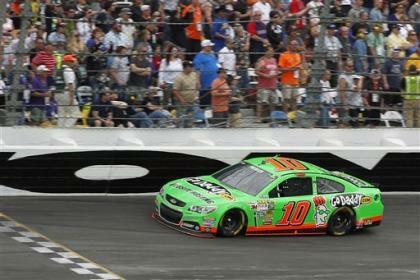 DAYTONA BEACH, Fla. – Danica Patrick seized the lead in the middle of Sunday's Daytona 500, nothing but daylight ahead on Lap 90 of 200. She was the first female ever to run in front under a green flag at NASCAR's Sprint Cup level, just needing to cruise through Turn 4 and hit the start/finish line to make it official. In the "500 Club" located high above Daytona International Speedway, Patrick's mother and father, Bev and T.J., and her younger sister Brooke, all looked down as she whipped past them through this famed frontstretch with an emotional mix of pride, relief and I-told-you-so satisfaction. "I knew she'd lead a lap," Brooke said after the race. "I just knew she could do it. I never had a doubt." "I just kind of thought, 'Oh, there's history again,' " Bev said. "Then it was, 'Keep going, keep going.' "
Danica kept going all right, running all day near the front of the pack, leading again from laps 127-129 and barreling along in third place halfway through the final lap, the checker flag of all things waiting with a chance less than a mile away. "I thought my heart was going to pound out of my chest," Bev said with a laugh. Danica didn't win, beaten out by five-time Sprint Cup champion Jimmie Johnson. She ended up eighth, swarmed at the finish line by others, but the day was nothing less than an unqualified, historic success for the female driver with as many doubters as fans. "I don't know how many times she has to prove herself again," Bev said. Not that many more, it would seem. "She's a racer," said Dale Earnhardt Jr. "She's going to make a lot of history all year long." "It was a car on the track," Johnson said. "I didn't think of it as Danica. It was just another car that was fast." That's about all the compliments she's ever really sought. There will always be some wanting more from Danica and some of that is fair. She can still win in a stock car. She can still contend for a title. She can still show consistency on the diverse tracks of the circuit. And if she does it once, she'll be expected to do it again. And then again and again. That's how the sport works. Still, the idea of Patrick leading this race two different times for a total of five laps, running in the front, handling herself in packs with the best of the best, having at least a chance to win, even if her inexperience made it unlikely, was all thought to be a pipe dream when she made the full-time move to stock car racing last year. "She has the determination," Brooke said, suggesting others don't fully grasp her sister's strength. "She's so mentally tough." Danica is a big, tough personality in a small frame. She's never shied away from attention or controversy, never feared the swimsuit spreads or GoDaddy commercials. She'll scrap. She'll fight. She'll volley back at anyone she sees fit, on or off the track. And she's played this business for every penny it is worth. Yet with much attention, much is expected, and the ensuing darts and doubts and insults that came with all the promotion have always stung her family hardest. Moms tend to hear everything, no matter how much they seek silence. So yes, up in the luxury of the 500 Club this was significant, this was one more bit of proof that their daughter and sister was more than a marketing creation, more than just the product of great engineers who could get her to qualify first. Danica did something with it. She may never be the best driver in the world, but she's never suggested as much, they point out. And she certainly wasn't the one gushing over the day here. She said she wished she had done more at the end, when she admits she wasn't sure what the strategy would be to jump out of line in an effort to pass Johnson – it turns out no one else had the answer either. Getting pushed back in the last mile clearly ground on her. "Solid day, steady day," she described it. "Really nothing super duper eventful." Her joy in leading the race at various points came from her frustration of having Jeff Gordon pass her on the first lap, when her superior position gave her the best chance. She was determined to get that back. "It was just because I was disappointed I didn't do it off the bat like I thought I should have," she said. "So, it didn't really have to do with being a girl and leading." She pointed out that she became just the 13th person in history, regardless of gender, to lead at least one lap of both the Daytona 500 and the Indianapolis 500, which she managed in 2005. "I thought that was a much cooler stat for me." Family doesn't have to be so calm about it, although none of the Patricks were surprised by how things played out. Proud and relieved, yes, but there was little doubt. "With Danica, she does better when the pressure is on," Brooke said. "I think it just shows the kind of driver she is; there's a reason she keeps breaking these records." Where this keeps going is anyone's guess. NASCAR has to be thrilled. Fox and ESPN, too. As the 500 churned on and Danica remained in contention, social media exploded. Ratings are expected to show a spike in viewership. Of course, superspeedways such as Daytona have always played well for Danica. There is work to be done on other tracks. And she was the first to say she isn't recalibrating her goals for the season – the first she'll run all 36 Sprint Cup races, a long, slow grind. The prerace sight of her walking through a massive crowd of fans toward the pole though, or sailing around this iconic, high-banked track with no one in front of her, or blasting toward the finish, side-by-side with the sport's elite, will be impossible to forget – for both her fans and, perhaps begrudgingly, for many of her critics. And for the family that's believed the longest and hardest, the vision from high above of their daughter and sister once again rewriting the sport's history will linger with prideful smiles. "That," Bev said, "was everything I dreamed for today." Another day at the track proving everyone else wrong, and mom, dad and younger sister right all along.